Jonathan Rintels | Author of Lifemobile, etc., etc. Amazon and other online booksites are often sold out of Lifemobile, I have no idea why. Anyway, their loss is your gain! We are having a sale on copies of Lifemobile personally inscribed by yours truly, the author, that are sold here on the Lifemobile website. Starting today, each copy of Lifemobile is just $8 — that’s LESS THAN AMAZON! And domestic U.S. shipping is free! Order yours today by clicking here! And please include instructions on how you would like each copy inscribed and signed in the Special Instructions to the Seller section when you check out via PayPal. Thanks so much for your support of this book and a great 2016! For the Christmas and holiday season, we are having a sale on copies of Lifemobile personally inscribed by yours truly, the author, and sold here on the Lifemobile website. Starting today, each copy of Lifemobile is just $11 — that’s LESS THAN AMAZON! And if you want to give the gift of a warm and funny book to lots of family and friends that even the often cranky Kirkus Reviews applauded, shipping for THREE or more copies is FREE (U.S. addresses only). The Virginia Vair Fair is always fun, with many old and new friends showing off their Corvairs. This year, the Vair Fair is in beautiful and historic Lexington, from May 29-31. I’ll be there on Saturday, May 30, starting at 9 a.m., to sign Lifemobile during the People’s Choice judging, when all the cars are nicely polished. I hope to see you there. The Vair Fair will be at the Lexington Howard Johnson’s Hotel, at Interstate 81 exit 195, Route 11. More info and directions are here. Really looking forward to reading Lifemobile at the Charlottesville Senior Center on Friday, April 24, at noon. The public is invited, so bring your lunch and come on by, it’ll be fun. Map and directions are here. I just saw this article from August 2007 in Hemmings, but it’s as timely, insightful, and fair now as it was back then. Admitting up front that the Vair’s past is “checkered,” it nevertheless finds the car’s glass more than half full, describing its advanced technology and its place in American history, not just the history of cars. After all, the writer notes, it was the controversy over the Corvair that spawned the consumer protection movement, Ralph Nader, the birth of the Mustang and the Pony Car era, and the long overdue upgrading of safety in autos. As someone who appreciates the plucky Vair not just for what it is, but also for its role in history, technology, and pop culture, I thought this was a terrific read. Check it out, here. Corvair Days are this coming weekend, Sept. 13-14, at the Antique Auto Club of America (AACA) Museum in Hershey, PA. I’ll be there signing Lifemobile on Saturday, Sept. 13, and look forward to seeing old friends and making new ones. Directions to the AACA Museum are here. I’d hoped to see the Museum’s new Tucker exhibition, featuring the cars and collection of David Cammack of Alexandria, VA, but unfortunately that won’t open till October. I toured Dave’s collection not long before he died. He couldn’t have been more gracious to our Corvair club members; for a person interested in the history of cars, it was a wonderful experience. 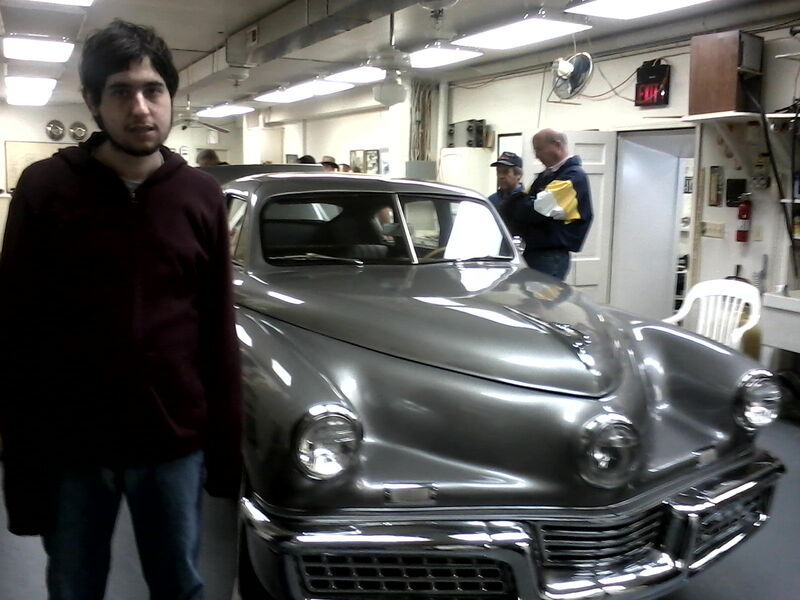 Here’s my son, J.B., the inspiration for Benjy in Lifemobile, in front of one of Dave’s Tuckers.